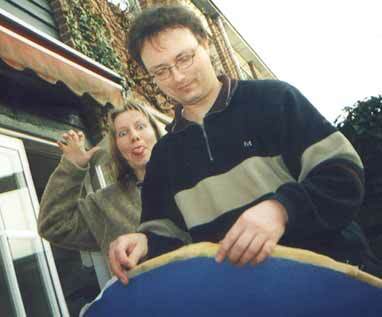 This page is about making a basic item, the shield or scutum. Well, a flat shield, that is. I am at the moment attempting to construct an oval convex/dished shield make of planks, but I will tell you how that went at a later date, I hope. Best start with buying a shield boss. These are widely available in all kinds of shapes and sizes, but the main thing is that you remember to fit your hand in one, with a glove if you use that. Although you can drill holes for the rivets/coach bolts, most are sold with holes, a four or five (star-pattern) will do just fine. Remember to ask for bolts if you don't have a supplier handy. Of course, to be authentic you'd need three layers of about 3mm thick wood, glue them together and then start sawing the shield. Plywood comes in 3mm so you could use that. 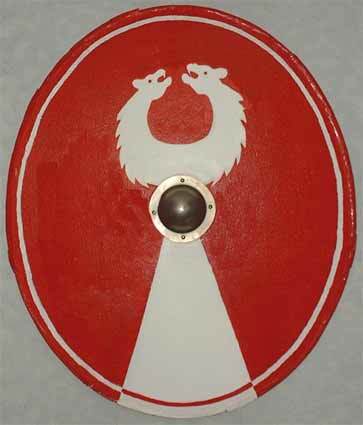 But this shield is meant to be a first one, none too fancy and sturdy enough to survive a season's fighting or more seasons showing off. Therefore, you'd best buy a single sheet of plywood, which in itself is pressed wood in three layers. This sheet should be 6 or 9mm thick, no more or else the whole thing will be too heavy. If you carry it around for a whole day your arm will start protesting about that folly. Any thinner will get you a lighter shield, but much more vulnerable as well. 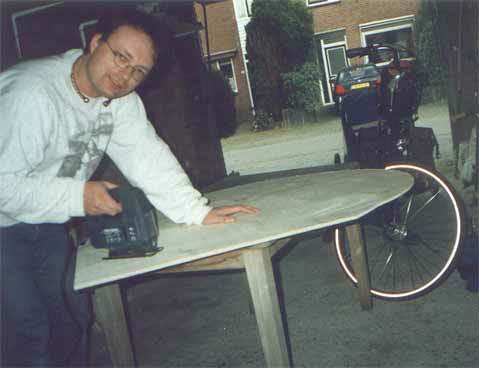 Now you've got a wooden board, next is how to get a shape on it. 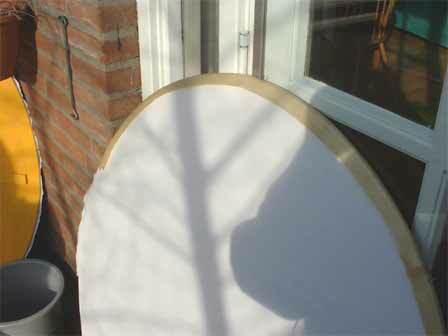 If you did this before, you can draw an outline for the next shield, which is why I save the cut-out leftovers (below). But if this is your first you need to to some arithmatic. For an oval, you can't simply draw a circle so you need two nails, some string, a pencil and a formula. Stick two nails in the shield, take a string which is a little more than twice the lenght between them and draw an oval with a pencil, by putting the pencil on the inside of the string and then move it about. Simple? Not! 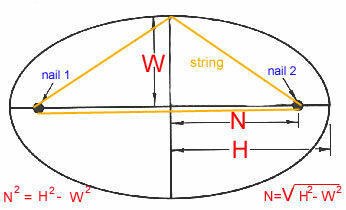 The formula is needed to decide where to stick your nail and determine the lenght of the string. 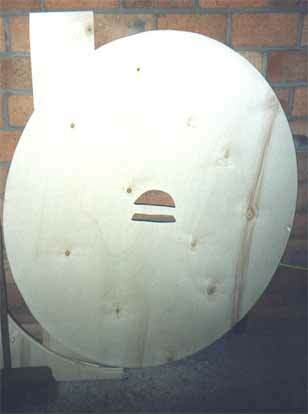 Most shields of our period measured between 1.07 and 1.18m in length and 0.92 and 0.97 in width. Mine is 1.18 x 0.97m. This is the formula: If H is half the height of the shield, W is half the width and N is half the distance between the two nails. N square = H square - W square. Or, N is the root of (H square - W square). So, to determine the lenght of your string, you need to determine the distance between the two nails. In my case, the sum was: N square = 58 square - 48.5 square, or the root of (3364-2352.25=1011.75) = 31.8cm. Easy, isn't it? My nails needed to be that far from the middle to draw a nice oval. That was the hard part, which is why I save those cut-out remains! The Scutum is always a bother when first drawn. Use two nails, a pencil and a string to get the oval shape right. 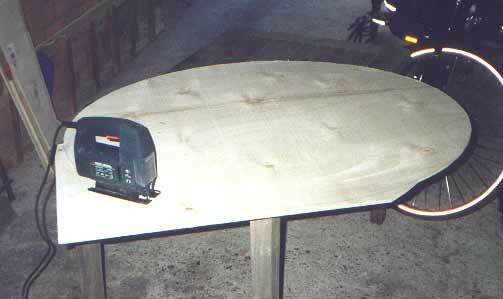 When the shape is drawn, use a sturdy table to saw the shield (and best use protective goggles). Nearly finished. Save the cut-away edges, so you can copy the shape of this shield. The finished product, with cut-out grip. A power jigsaw will get the job done in minutes. Save what you sawed off for future use and sand down the edges for safety and a smooth feeling. Now, place your boss on the middle and draw around it to determine where your grip will come. Remember that the cut-out must be smaller, so first measure the rim of the boss. Either cut out a circle when you use a separate handgrip, or a semi circle and a trapezoid like in my example. I glued a wooden reinforcing cross-bar horizontally on the back (below), which served as grip as well. There is some discussion about that, but for later period shields the horizontal option is the one most represented in finds. A thin shield may best be re-inforced vertically as well for strenght. Now drill the holes for your boss and try it out. Best mark which hole goes where, bosses usually aren't that symmetrical. Do NOT add the boss right now, that's the last thing to do when the shield is finished. You can start painting the back at this point. Facing your shield will make it sturdier and give it a longer life. You can use leather or cloth to cover the front. Because leather damages easily (a sword can take a chunck out of it) you'd best use thin leather, canvas or linen, which is what I have used. Take a sheet and stick it carefully across the front, right to the edge or a little over it. Use watered-down wood glue for an adhesive, that will do fine. Smooth it over so you can see no wrinkles and take care to ensure that the cover sticks down all over, or else you will get creases. You can make several shields at once, of course. 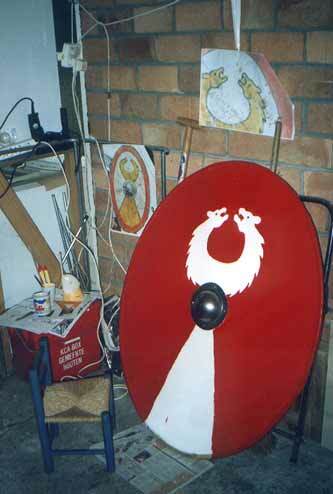 However, not all phases of making a shield can be done at the same time. Painting can, as well as covering the front. 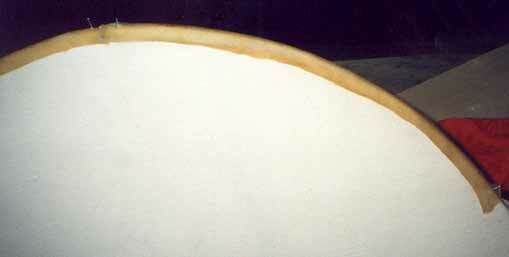 The front is covered with a sheet of linen, ready for applying the edges. 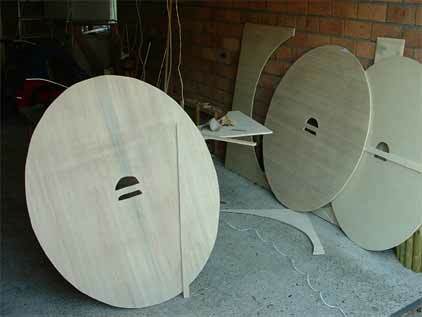 These shields are ready for applying the rawhide rim. Both are painted on the back and have a linen covering of the front. I usually don't cut the linen over the grip until I've painted the front. Next is the edging. You can use rawhide, leather or metal for this. The latter, however, is more for earlier periods, and as leather is not as hard I've used rawhide, which is also the most common material for the period. 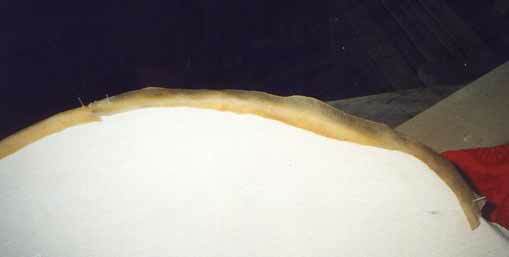 Rawhide can be found in pet shops as dog bones, which are really just folded strips of rawhide. 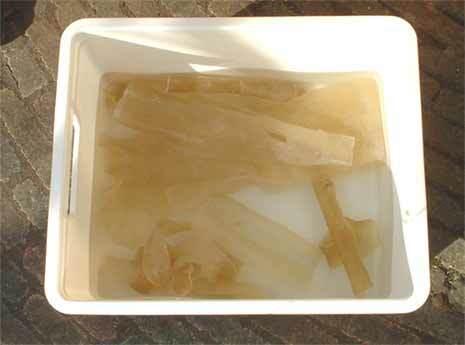 However, take care that you don't use rawhide which is thicker than 1-1.5 mm, as that will take too long a time soaking. Even then it will be next to impossible to sow to the shield. Thin rawhide will work best. 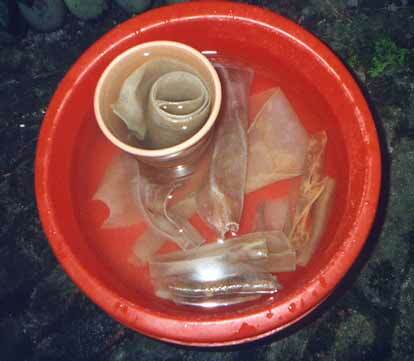 Just soak the bones for a good period (but not hours) and when they start to smell, take them out and unfold. Next stage, the rawhide edge. 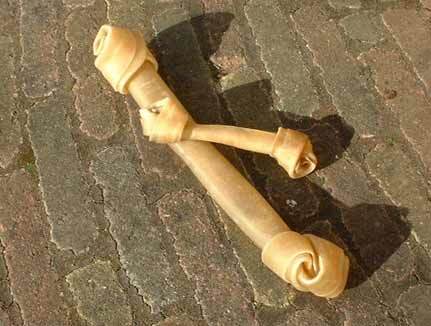 These are 'dog bones' made of rawhide as you can buy them in pet shops. Let the 'bones' soak a good while (ignore the smell) before unrolling and cutting them up in strips. Unfold the bones when the've soaked for about an hour, and remove the small bits you can't use. When soaked, nail the strips to a plank and cut them into neat strips of about 5 cm. Before you start cutting the strips, determine how wide your edge is and how wide the strips must be. You need an overlap of about 10-15mm on each side, so a strip of some 5cm will do fine. Also, determine how you will apply the strips. 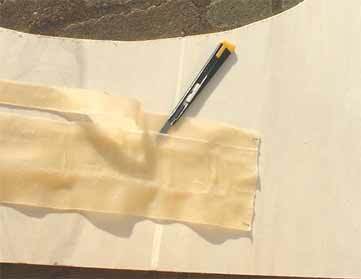 If you drill the holes before applying the rawhide, the material is still soft and easy to sew on. The drawback, however, is that rawhide shrinks when drying and it may cut your string when it does. You can also drill the holes after the rawhide has dried, but the stuff's tough and it may cost you a bit. Also, even after a week's drying, the rawhide (when put in a hot place) can shrink back 2-3 cm! I've experienced both methods, and my solution is to let it dry for a few days in a cool spot, then drill the holes. 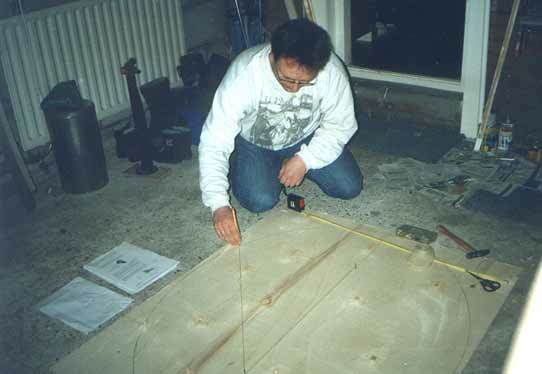 First, measure the strips out on the edge, by nailing them loosely. 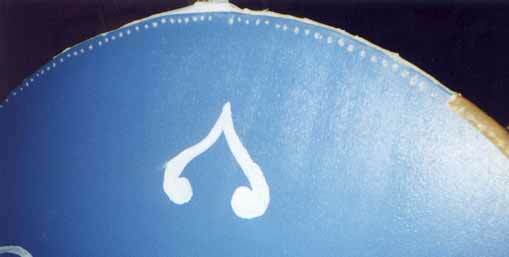 Then, stretch one end over one side of the shield and nail down. 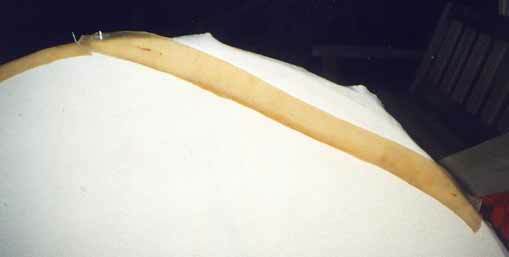 Then, like a bicycle tyre, pull the rawhide back over the edge, so that it stretches tight. The rawhide shrinks when it dries, so you might want to drill the holes after it has dried. Do not drill too close to the rim, as this might break when the stitching pulls out, or when your shield receives a good blow. Try and keep the holes evenly spaced, I know it's hard because there may be hundreds to drill. But remember, it was no machine-job in ancient times, and the line is allowed to be a little uneven. Sow the rawhide on with a linen thread, or another strong, period-like fabric. This can be hard work and several needles may break, so be sure to have a spare handy. After the edge is done and has dried, you may paint the front of the shield. Best use several layers of paint to make it a bit more sturdy, and to make sure that the first blow will not show the wood. When it has dried, you can bolt down the boss. 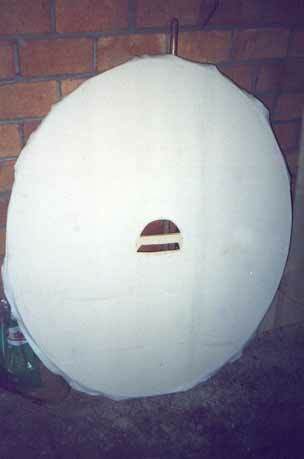 The final stage of making a shield. You have already drilled holes for the boss and marked which one goes where (a boss that doesn't fit would cause a bit of problems in this stage). Cut down the rivets so that they are as long as the boss, the board plus the washer, plus about 2mm. Cut away the rest with a hacksaw. Cutting off too much will leave you with a wasted rivet, too little and it won't rivet right. For washers, you best make these yourself by drilling through a sheet of metal (bronze or brass looks good) and cut around it in a ring or a triangle. Now bolt down the boss, apply the washer and hammer flat what is still showing of the rivet down with a ball peen hammer. The boss is now securely attached. If you need to finish off the painting, this is the time. You may leave the rim bare, but I like to paint it, because I feel the 4th century Roman loved as much color as he could get. I painted it in the color of the front for effect, but of course you could paint it every color, even black would do fine. The boss, too, may be painted over, as we can see in several examples from Late Antiquity, although this time I chose to leave it as it is. 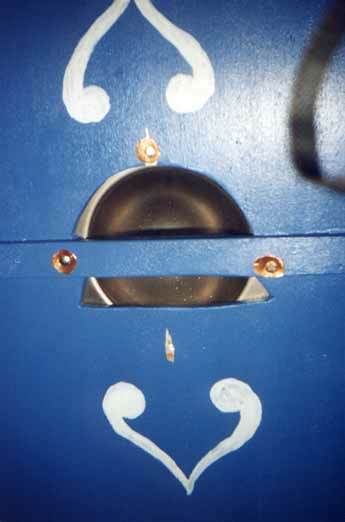 The painted back, with glued-on cross-bar and washers in place (finished stage). 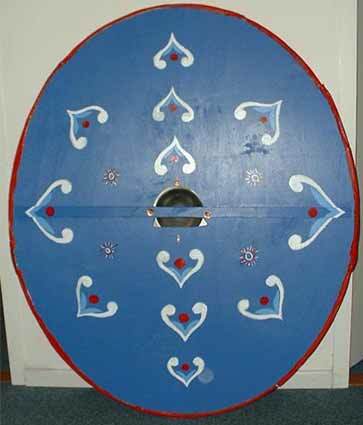 The shield is finished, and after painting the front, the boss can be added. 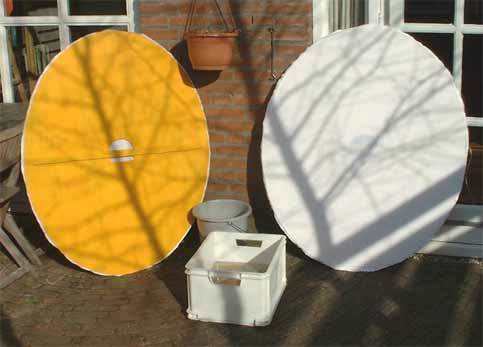 For the washers, use a sheet of metal, such as bronze or brass. The finished product, showing the unit design of the (imaginary) Fectienses seniores. The finished product, the back showing an individual design based on a Dura Europos shield. The shield is now finished. Have fun with it. Bishop, M.C. and J.C.N. Coulston (1993): Roman Military Equipment, from the Punic Wars to the Fall of Rome (Batsford). Stephenson, I.P. 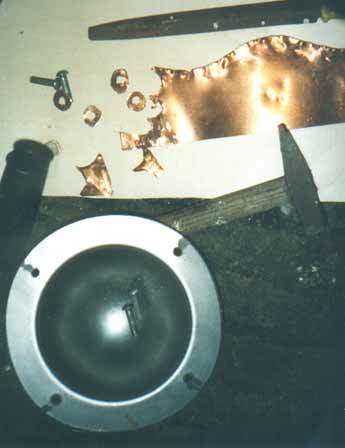 (1999): Roman Infantry Equipment, the Later Empire, (Tempus).